Ford-UAW deal shifts most car output to outside U.S. The Ford Taurus, assembled in Chicago, could be discontinued or built only in a low-cost country such as China. DETROIT -- UAW leaders today approved a tentative labor contract with Ford Motor Co. that could lead to most car production leaving the U.S. by the end of the decade. Ford’s 53,000 hourly workers will begin voting on the deal later this week. The agreement closely mirrors the UAW’s contract with GM, which was approved by a majority of workers but is being held up by opposition from skilled-trade employees. Wage and benefit changes are mostly identical, though Ford workers would get a ratification bonus of $8,500, or $500 more than GM workers were offered. The union said Ford agreed to invest $9 billion during the next four years, creating or keeping 8,500 jobs. A chart the UAW distributed to its members today shows that unidentified new vehicles would be added at assembly plants in Chicago; Wayne, Mich., and Avon Lake, Ohio, in addition to those previously announced. Production of four U.S.-built cars, the C-Max, Focus, Fusion and Taurus, would last only through current product lifecycles. Ford also builds the Fusion at a plant in Mexico, and production of the Focus and C-Max is expected to go to Mexico. The Taurus could be discontinued or built only in a low-cost country such as China. At that point, the Ford Mustang and Lincoln Continental would be the only cars staying in the U.S. The Continental is scheduled to join the Mustang in Flat Rock, Mich. in 2016. Ford's Louisville assembly plant will stop building the Lincoln MKC crossover to increase output of the Escape. 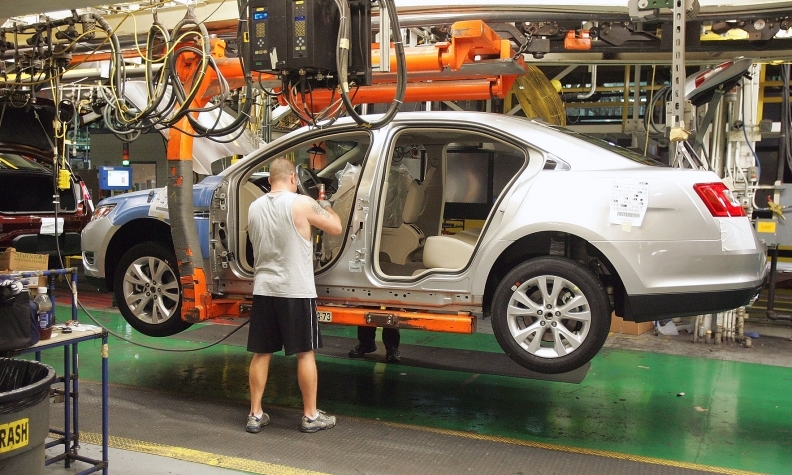 It’s unclear where MKC production will move. The plan calls for the Michigan Assembly Plant in Wayne to get a new vehicle in 2018, after the Focus and C-Max leave, and a second model by 2020. Sources have said the new vehicles will be a Ranger pickup and Bronco SUV. The contract says Ford will not close any U.S. plants for the length of the contract. A stamping plant in Woodhaven, Mich., which had been expected to close, will receive a $300 million investment to stay open as a hot metal-forming plant. Ford agreed to remove a $12,000 cap on profit-sharing checks, meaning workers could receive larger payouts if Ford posts an annual North American profit of more than $12 billion, which would be a record for the company. Its best year on record in North America was 2013, when it earned $8.8 billion. Ford earned $6.6 billion in North America in the first nine months of 2015, including a record $2.7 billion in the third quarter. That translates to $6,600 in profit sharing so far.